The Stephen F. Austin State University Early Childhood Laboratory has earned accreditation from the National Association for the Education of Young Children - the world's largest organization working on behalf of young children. SFA students in the Department of Elementary Education work in the ECHL to practice skills they have learned in the classroom. 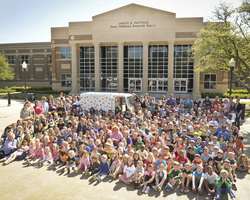 NACOGDOCHES, Texas - The Stephen F. Austin State University Early Childhood Laboratory has been recognized as one of the top programs in the nation by earning accreditation from the National Association for the Education of Young Children - the world's largest organization working on behalf of young children. NAEYC Accreditation is a rigorous and transformative quality-improvement system that uses a set of 10 research-based standards to collaborate with early education programs to recognize and drive quality improvement in high-quality early learning environments. "We are proud, once again, to have earned the mark of quality from NAEYC and to be recognized for our commitment to reaching the highest professional standards," said Lori Harkness, ECHL director. The ECHL is a facility maintained for the education of SFA students preparing to work with young children and their families. It is administratively associated with the Department of Elementary Education, but is dedicated to meeting the needs of university students in various early childhood education and child development courses in the School of Human Sciences, as well. The lab's program facilitates the total development of young children. Curriculum is intended to develop intellectual and personal competence rather than to train children in performing a limited set of academic skills. To earn NAEYC accreditation, the ECHL went through an extensive self-study and quality-improvement process, followed by an on-site visit by NAEYC assessors to verify and ensure the program met each of the 10 program standards and hundreds of corresponding individual criteria. NAEYC-accredited programs are prepared for unannounced quality-assurance visits during their accreditation term, which lasts for five years. In the 30 years since NAEYC accreditation was established, it has become a widely recognized sign of high-quality early childhood education. More than 7,000 programs are accredited by NAEYC - less than 10 percent of all child care centers, preschools and kindergartens nationally achieve this recognition. "NAEYC-accredited programs bring our definition of excellence for early childhood education to life each day," said Kristen Johnson, senior director of Early Learning Program Accreditation at NAEYC. "Earning NAEYC accreditation makes the SFA Early Childhood Lab an exemplar of good practice for families and the entire community." To learn more about the ECHL, visit sfasu.edu/echl.